I was introduced to the delights of Strauss�s Don Quixote by the extravagant reading of the solo cello part by Paul Tortelier which he first played in the London Strauss festival in 1947, his idiosyncrasies enjoyed by many on BBC television in the 1960s. However locating a set of the Mainardi 78s which played very sweetly I had them transferred to an acetate LP in the 1960s and have long preferred Mainardi�s sweetly played, aristocratic account. Heard anew in Dutton�s miraculous transfers the recording has a presence and character astonishing for 78s now over seventy years old. The orchestral balance is remarkable, a benchmark for all assessments of the work. Strauss recorded over a quarter of a century starting with a number of acoustic recordings including Don Juan, Salome�s Dance and the Rosenkavalier Waltzes with the LSO. In 1926 he was again in London, recording his specially arranged score for the silent film of Rosenkavalier by the new electrical process. 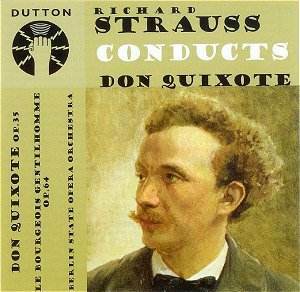 Worth looking out for is Strauss�s 1936 off-air Queen�s Hall performance of Don Quixote with Karl Hesse, first cello of the Dresden State Orchestra now on Appian CD APR 5527. Despite the murky sound it allows us to share what Londoners experienced on a Saturday afternoon in 1936. During the Second World War Strauss recorded Don Quixote again with the Bavarian State Orchestra and Oswald Uhl � I presume the first cello. I have it on an American Columbia LP (DL 9539). It is on CD on Preiser 90205. I must say that although the wartime recording was intended to improve on the sound of the earlier version it is no match for the earlier version and Mainardi is in a league of his own. The Le Bourgeois Gentilhomme suite was recorded in 1930. Quoting Alois Melichar, who was present, Alan Sanders in his excellent booklet notes recounts how the suite was recorded: �Melichar recalled that at the 1930 Bourgeois Gentilhomme sessions Strauss started by playing through the overture, and then immediately asked to record it. Melichar countered this proposal by suggesting a test recording, which was duly made. The composer declined Melichar's invitation to listen to this, and merely asked him to point out anything that was wrong. After listening to his comments Strauss and the orchestra then made their record of the overture. The whole suite was recorded in this way, to the consternation of the players, and if lack of adequate rehearsal meant that execution could have been better Melichar observed that the performance certainly possessed concentration and intensity.� These are stylish, beautifully turned performances in a manner now long past, The solo violinist in the �Dance of the Tailors� movement delivers playing of a stature you will hear on few other recordings. But you will buy this recording for the Strauss/Mainardi reading of Don Quixote which is one of the greats, here given its best possible presentation, at budget price. Strongly recommended.